March is “National Developmental Disabilities Month”. DSC is excited to join people and agencies all over the United States to celebrate it! The campaign, “See Me for Me” has four different focuses. This week’s focus is on employment. Ben is being featured under the segment of employment because of his incredible work ethic and his involvement in the Special Olympics. 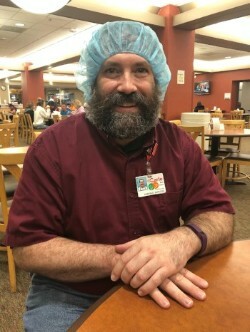 Ben has worked at Carle Foundation Hospital for seven years where he is responsible for stocking the cafeteria. Ben loves his job at Carle because it allows him to stay busy, socialize with his coworkers who have become some of his great friends, and make money. Ben was invited to be a part of the 2018 Special Olympics USA Games, which will be taking place in Seattle, Washington on July1-6, 2018. His powerlifting abilities will be showcased. He looks forward to training camp that will be taking place in April where he can practice squatting, bench-pressing, and deadlifting. Ben anticipates having a great time and is excited to meet new people. In his free time he likes to build and launch rockets and in the summer he practices softball with his team the CU Special Rec Mustangs. Ben has many talents and an exceptional work ethic. Congratulations and good luck, Ben at the 2018 Special Olympic USA Games!